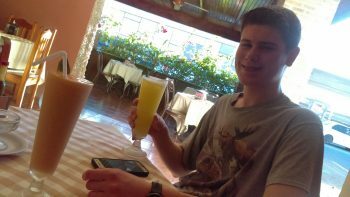 This February break, I spent a week with my son Max (15) studying Spanish and living with a local Costa Rican family in Monteverde. Last year we had spent a week studying Spanish at the CPI-Monteverde Spanish Language Immersion school. My son Max enjoyed it so much, that he was eager to go again and get a chance to learn and speak more (something that is a challenge when you live in Northern Minnesota). Max and I chose to stay with a Tico family this time around. We were of course a little bit nervous, staying for a week with a family we did not know and having somewhat limited conversational skills. On the other hand, we approached it as a fun adventure and bonding opportunity. Max probably knew more vocabulary than me, but he was a bit shyer to talk. I didn’t mind talking and used Max as my dictionary when I could not find the right words. We made a great team! It was fun to stay with a local family. In our case the parents (Rony and Yerlin) were my age and they had two daughters (Mariella and Aylin), one of which was Max’s age. The typical Costa Rican house is, not surprisingly, a lot smaller than what we are accustomed to in the U.S. and the construction is simple and functional. It can get a bit chilly (60’s F) at night and windy on the mountain in Monteverde. The typical electrical water-heater showerhead that is used here can feel a bit frigid. My son Max who is 6’5” was at times a bit challenged as he had to duck to not bump his head on door frames. The language program consists of 4 hours of very small group (2-5 students with 1 teacher) instruction using a well developed curriculum. Prior to arrival you will take an on-line assessment test and do an interview via Skype to determine your language level and area of interest you want to focus on (business, medical or more general conversation, writing, grammar etc.). Depending on this, you are matched with a group and instructor. In addition, many students choose a home stay with a local Tico family. This allows you to practice your conversational skills and learn a bit more about the daily routines of a Costa Rican family. You have breakfast and dinner with the family, which is a great time to talk about your plans for the day, what you did and learn more about your host family. 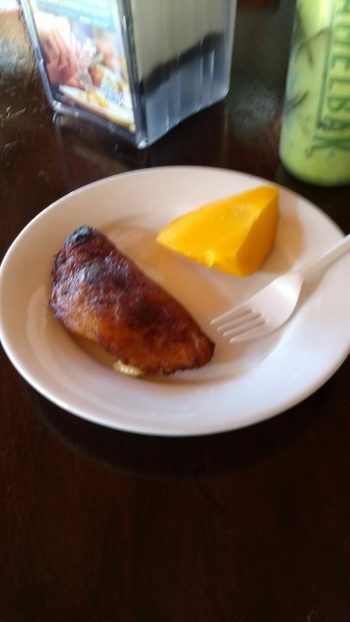 The food is typical local fare, such as gallo pinto (rice and beans) and eggs for breakfast with fruit. The afternoons we had off to explore the Monteverde area. The reason I like staying here is that there are so many options for fun activities. You can book various tours through CPI or can strike out on your own using the local bus service. 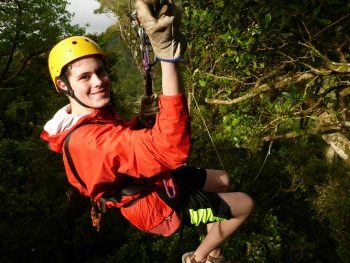 Max, being a teenager, loved the thrill of ziplining through the canopy. 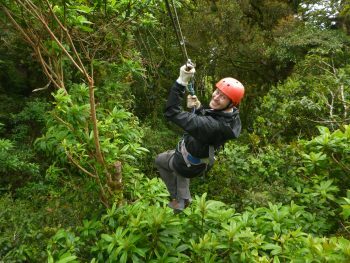 We did the longest cable in Latin America, a full mile flying Superman style (100% Aventura)! We also enjoyed going on walks through some of the many cloud forest preserves in the area. For lunch and snacks we had fun checking out the various small sodas, bakeries and coffee shops. When we finished in Liberia, we lucked out and were there during the Fiestas Civicas. This is a truly local, regional fiesta and we had lots of fun people watching, checking out the music and street venders. 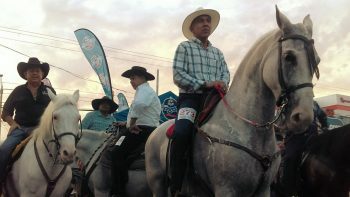 The Guanacaste region has a strong local culture around ranging and horses. 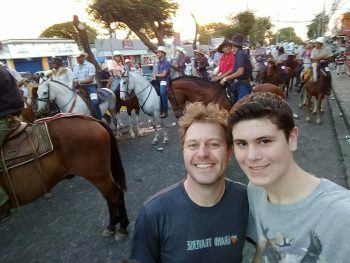 We watched the Desfile de Caballistas (the parade of the horseback riders) and I guess there were close to 2000 horseback riders parading down the streets.